To identify the furniture style, you match the specific attributes of your furniture to the attributes shown in the Furniture Styles application. 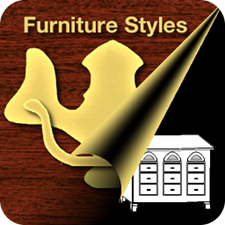 Once you have finished, the App matches the selected attributes to their usage in nineteen historical furniture styles. To increase accuracy and create a richer profile, select as many attributes as you can reasonably identify to describe the furniture. Additional attributes may be selected at anytime. A built-in style reference provides detailed information about each style. Although matches do not indicate the actual age or authenticity of the piece, attributes are significant indicators to identifying architectural style and the period the style originated.